Social media has put a proverbial microphone in front of every person, with its speakers aimed toward the world. Faced with this golden but loaded opportunity, we can choose to whisper into it, shout at it, or turn it off entirely. Many people choose to embrace the microphone: Facebook generates four petabytes (that’s 4 million gigabytes) of data every day, Twitter chirps out 500 million new tweets, and an average of 80 million snapshots are shared on Instagram from sunup until sundown. However, if you look past the sea of fluffy posts showcasing latte art, exotic destinations, and huggable pets, you’ll find a more serious side to social media: political discourse. The crossroads of social media and politics is a reality of extremes. It has revolutionized the way candidates run their campaigns while stoking the flames of anger (based on the use of the “angry” reaction on Facebook) in the wake of the 2016 election. It can be a tool for activism and engagement or a breeding ground for hateful trolling. In a political landscape that features a rapidly expanding chasm between Democratic and Republican values and bubbling negativity toward the opposing party, there is no shortage of politically charged topics and ideas to share on social media today. To better understand the complicated political relationship Americans have with social media, we surveyed 1,010 individuals who reported having at least one social media account they used once per week. Read on to learn more about who’s posting, who’s fed up, and everything in between. The marriage between social media and politics is the ultimate double-edged sword. On the one hand, it has ushered in a new era of enhanced communication and heightened involvement: Candidates and voters have never had a clearer path for productive dialogue, there is essentially no barrier to entry for participation, and the conversation can continue and thrive long after the ballots have been tallied up. On the flip side, social media can be divisive and polarizing. It can create “filter bubbles” or “echo chambers” that reinforce our existing beliefs, creating a personal news feed soaked in confirmation bias and familiar opinions. In terms of the content we interact with on a regular basis, Americans are feeling worn out and isolated by the quality and quantity of the discourse unfolding online. 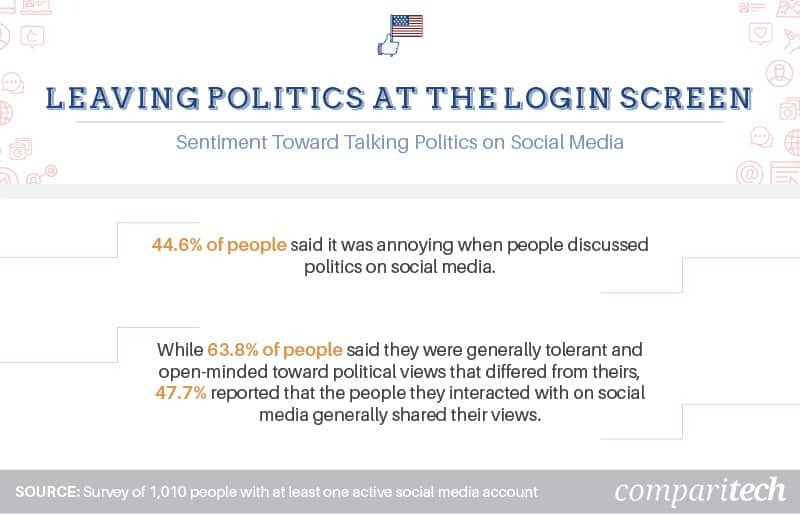 Nearly half of our respondents felt annoyed when people discussed politics on social media. 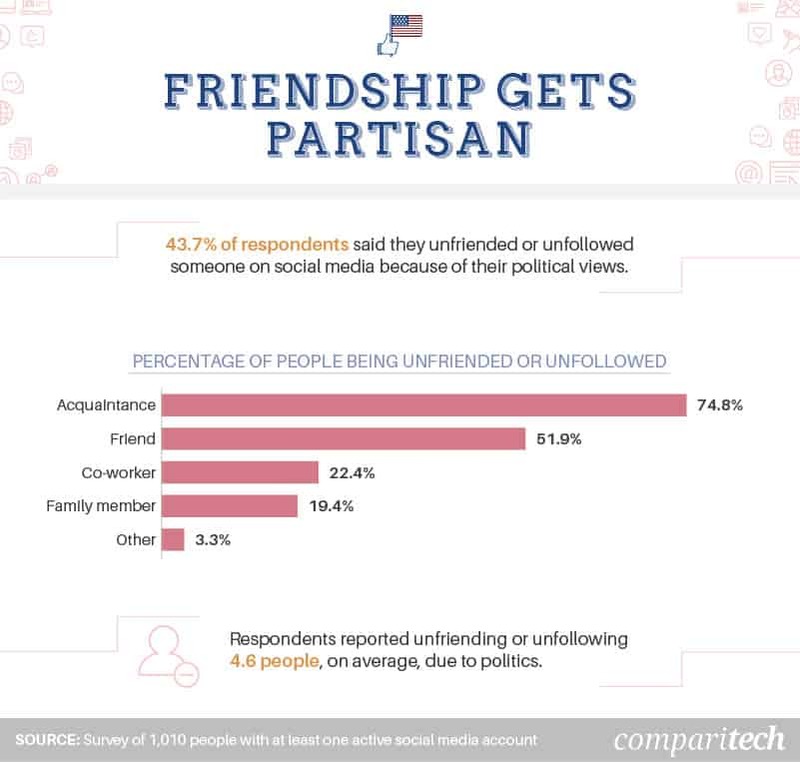 And while almost 64 percent said they were open to interacting with views that differed from their own, around half said their news feeds were generally populated by people who shared similar opinions. One Pew Research Center study found that 53 percent of Americans (49 percent of Republicans and 57 percent of Democrats) found it “stressful and frustrating” to discuss politics with people who disagreed with them. Call them thick-skinned, call them bold, call them anything you want – some studies have shown that not caring what other people think is a common trait among those who discuss politics on social media. 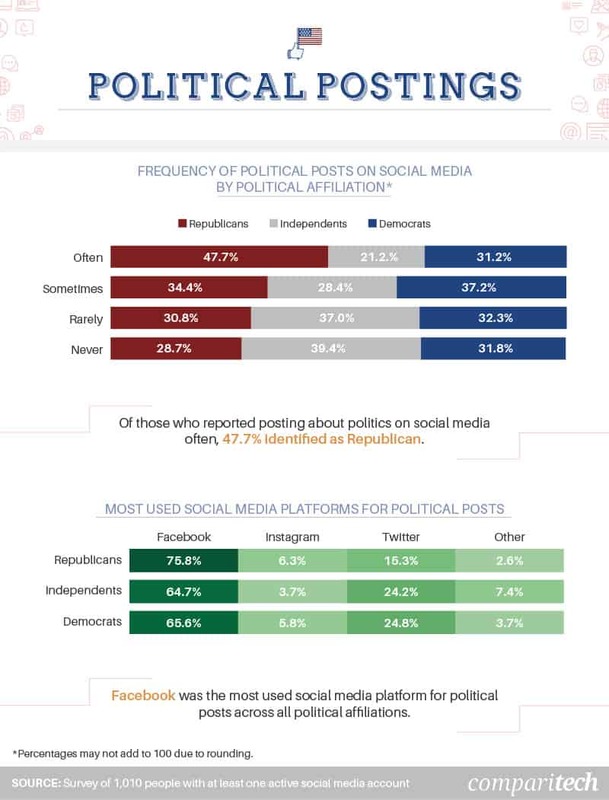 Among respondents who reported they “often” published political posts online, nearly 48 percent were Republicans, roughly 31 percent were Democrats, and around 21 percent identified as an Independent. The highest concentration of Democrats associated with the “sometimes” category, accounting for about 37 percent of people who posted at this frequency. 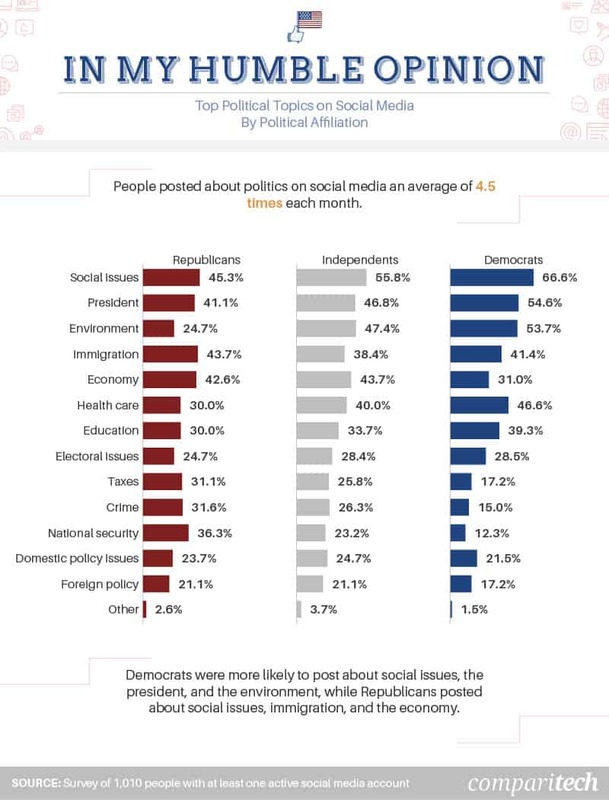 Independents seemed particularly averse to discussing politics on social media: Over 39 percent of respondents who “never” made political posts identified as Independent, compared to almost 29 percent of Republicans and nearly 32 percent of Democrats. No matter their political affiliation, respondents were the most likely to flock to Facebook as their online podium by a landslide. Text-based platform Twitter took a distant second, perhaps due, in part, to a loss of trust and interest in the platform. Anyone who has stumbled on political discussions on Facebook has probably noticed their tendency to devolve into digital slap fights, and text-based posts may be the worst of the worst. One recent study revealed that people were more likely to dismiss the opinion-giver as uninformed if they read about their political stance, as opposed to watching a video. While political posts may start to blend into an indistinguishable mass of opinions, laying out the parties’ most posted topics is an interesting exercise in differentiation. The single common thread that united Democrats, Independents, and Republicans was a focus on social issues. This topic was the most popular overall, although Democrats discussed it more frequently than the other two groups. Independents posted about a few core topics, like the environment, the president, and the economy, while Republicans seemed particularly focused on immigration, the economy, national security, and the president. Most recently, in response to the migrant caravan approaching the U.S. border, President Trump reinforced conservatives’ stance on immigration by mulling over an asylum ban, similar to 2017’s Muslim travel ban. Sometimes, hitting “publish” on a social media post can feel like shouting into the void – but the amount of interaction you rack up on any given status or share might just depend on the topic at hand. Among social media posts that received comments from others, those that focused on social issues garnered the most interaction. Posts about the president were not far behind. In fact, the current president and social media are entangled in more ways than one: Not only has President Trump expressed concern that these platforms are biased against Republican views but also his use of Twitter and the boisterousness that defines it has become a topic of worldwide discussion. Comments on posts about the president were also deemed to be the most toxic overall, according to our research – and in today’s highly polarized political climate, that may not come as a surprise. However, this issue extends far beyond the limits of political figureheads and hot-button social issues. Video giant YouTube is notorious for having out-of-control comment sections, and an increasing number of news websites are getting rid of theirs entirely due to a lack of productive discussion. For born debaters, moments of political disagreement may come as a welcome challenge, but many others will take specific measures to avoid exposing their views to certain audiences: Nearly 27 percent of respondents said they adjusted their settings on social media to hide their political posts from others, nearly half of which were intended to be hidden from friends or acquaintances, respectively. Another 42 percent of people admitted they fine-tuned their settings to hide political posts from other people, with acquaintances presenting the most frequent annoyance. When the grandstanding gets to be too much, there are multiple apps and extensions available to wipe your screen clean of politics once and for all. Ah, acquaintances. They’re great for a lighthearted chat over drinks or sharing a knowing glance during a board meeting, but the bond between acquaintances is far from strong enough to withstand the pressure of clashing politics. Nearly 44 percent of respondents said they deleted someone off their social media due to their political views or posts. Acquaintances were the ones most commonly being axed from social media feeds – 74.8 percent of people who admitted to unfriending someone said the person was an acquaintance. Nearly 52 percent of respondents reported removing friends, and 22 percent said they had unfriended a co-worker. Even though social media posting is often conducted off the clock, it’s usually best to keep politics out of the workplace (which does extend to the internet if you have co-workers on your social media accounts). While the same dissenting voice flooding your news feed on the daily can be frustrating, it’s also important to recognize the perils of being selective. Exposing yourself to opinions that don’t mirror your own is a crucial part of being an informed and active member of our social fabric, and welcoming conversations with people whose opinions differ from yours is an important step toward overcoming fear of the other side. Just remember to resist slinging accusations and avoid adopting an attitude of wanting to change your discussion partner’s mind from the get-go. The 2016 American presidential election was one for the books – and one that had social media discourse in its DNA. For one, the previous cohort of 2012 presidential candidates posted less than half as often on Facebook, Twitter, and the like. On the voters’ side of things, Facebook’s tendency to turn into an “echo chamber” (a situation in which your news feed, fed by your personal interests, continually reinforces your views by serving up articles and content that reflect them) saw social media users digging their heels even deeper into their beliefs. The echo chamber effect is so prominent, in fact, that Facebook is looking into a patent that would help round out people’s political news feeds. 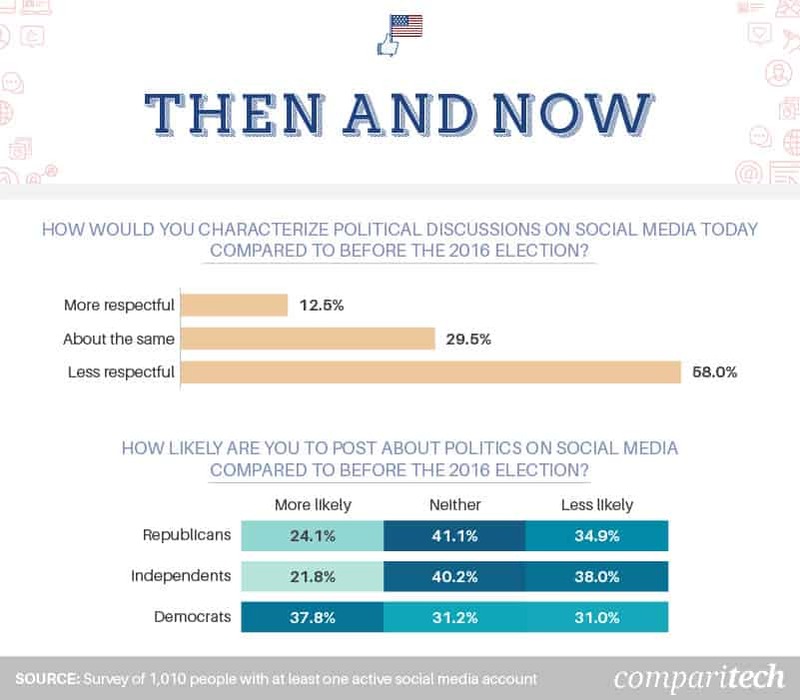 Social media has changed the way we interact with our political environment in many ways – and according to our respondents, since the 2016 election, one of the biggest changes is related to respect. Among those who had at least one active account prior to the election, 58 percent said they felt online political discussions were less respectful than they were before. Just 12.5 percent observed an uptick in respectful discourse since 2016. Often, heightened political conflict and dissent can lead people to mobilize. On the other hand, it can lead to apathy. Nearly 38 percent of Democrats said they were more likely to post on social media in the wake of the election, while less than a quarter of both Independents and Republicans felt the same. Supporters of Independent candidates gave the highest percentage of “less likely” responses; however, the largest number of people from this group felt they were “neither more nor less likely” to post online. Republicans had the highest concentration of “neither more nor less likely” responses of the three political affiliations. Posting about your political leanings affects more than just the thoughts and opinions of those on your friends list. Your Facebook and posts can be harvested for data used in targeted advertising. Sentiment analysis can be applied to the links and text you post to determine your political affiliation. Furthermore, advertisers can sometimes make an educated guess based the posts you like, groups you join, and pages you follow. This very behavior is at the heart of the recent Cambridge Analytica fiasco, in which a third-party developer used Facebook data from millions of unknowing account holders to target users and shape public opinion. That means engaging in any sort of political behavior on Facebook can result in more political ads and sponsored results showing up in your news feed, and posts from like-minded users are prioritized. This contributes to the echo chamber effect discussed above, in which users become more entrenched in their political beliefs because differing opinions rarely make an appearance. We surveyed 1,010 people using Amazon’s Mechanical Turk. Respondents had to report having at least one social media account that they used at least once a week to be eligible for the survey. Respondents were 51.9 percent men and 48.1 percent women. The average age of respondents was 37.8 with a standard deviation of 11.9. Respondents who identified as Libertarian, Green Party, or “Other” were excluded from our visualization of the data due to low sample sizes in those groups. Parts of this project break down data by political affiliation. For these visualizations, we weighted the data to equalize the sample sizes of the various political affiliations. In our final visualization of the data, respondents who answered “always” and “often” were combined into one group for clarity. 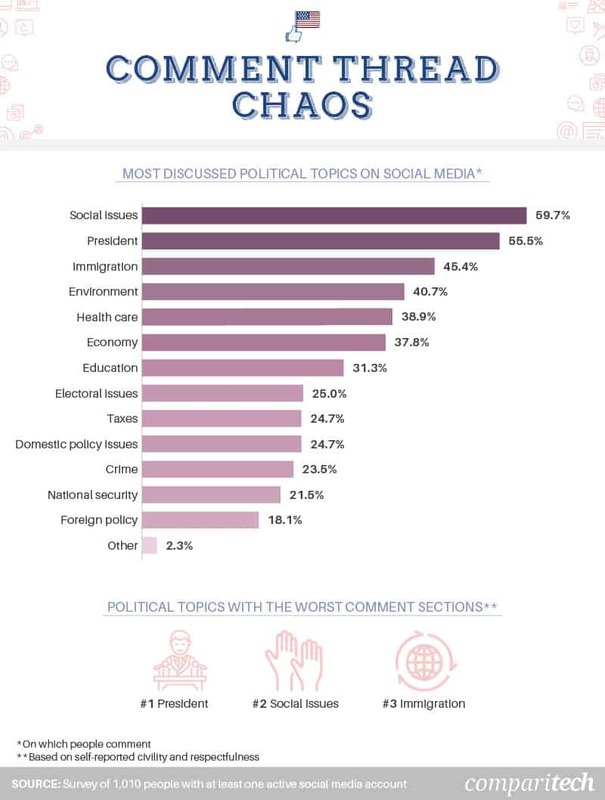 Respondents were asked about the political topics discussed in social media posts they chose to comment on. Then, based on their answers to that question, they were asked to identify which of those topics’ comment sections they deemed the worst in terms of civility and respectfulness. We asked respondents about whether they had blocked certain people’s posts and whether they’d unfriended/unfollowed people because of their political views. It should be noted that respondents were answering across social media platforms. For example, you don’t unfriend people on Instagram; rather, you can unfollow or block them. Additionally, there are varying degrees of familiarity based on social media platform. There are platforms where people might not personally know someone, but they “follow” that person. Because this data was gathered through a survey, it relies on self report. Potential issues with self-reported data include exaggeration, telescoping, selective memory, and attribution. For example, parts of this project include comparisons of political discourse online before the 2016 election versus after the election. It’s possible that survey respondents selectively remembered certain facts or sentiment from prior to the election. Whether you currently choose to discuss politics on social media platforms, you’re welcome to share this study for any noncommercial reuse. If you choose to do so, please link back here so others can review the entire project.